In the early morning hours, one of the worst industrial disasters in history begins when a pesticide plant located in the densely populated region of Bhopal in central India leaks a highly toxic cloud of methyl isocyanate into the air. Of the estimated one million people living in Bhopal at the time, 2,000 were killed immediately, at least 600,000 were injured, and at least 6,000 have died since. Bhopal was a city in India’s Madhya Pradesh region between New Dehli and Bombay. The Union Carbide pesticide plant was located in Jai Prakash Nagar, a particularly poor area of the impoverished city. Later, some critics charged that these factors were part of the reason that the plant had outdated equipment, lax management and grossly inadequate maintenance and safety procedures. On Sunday, December 2, the 100 workers on the late shift were in the process of making the pesticide Sevin. This involved mixing carbon tetrachloride, methyl isocyanate (MIC) and alpha-napthol. Over the next 12 hours, a series of astonishing errors led to disaster. The MIC at the plant was stored in three partially buried 15,000-gallon tanks. When there was a problem with one of the tanks, nitrogen was forced in to extract the MIC. However, on this day, the process was not working correctly and both MIC and nitrogen were leaking. At about 11:00 p.m., the gauges began to indicate a dangerous level of pressure in the tanks, but the workers thought the instruments were malfunctioning and took no measures to alleviate the problem. By 11:30, the workers in the vicinity of the tanks were having a physical reaction to the leak, a feeling that many were familiar with because it happened with some frequency. Even then, Shakil Qureshi, the supervisor, decided to wait until after a tea break to look into the situation. By then, it was too late, and panic ensued as an explosion rocked the plant at approximately 12:15 a.m. Firefighters attempted in vain to use a curtain of water to stop the gas from escaping the plant. The gas simply flowed over the top of the water. A piece of equipment called a vent gas scrubber, intended to prevent toxic gas from spreading, completely failed to operate. In the midst of the chaos, the drivers of the emergency buses ran away instead of driving the workers to safety. Even worse, the plant failed to inform local authorities immediately, later claiming that the phones weren’t working. People living in the vicinity of the plant were close enough to hear the alarms but ignored them on December 3 because alarms at the plant were so frequent. The cold weather that evening kept the gas close to the ground as it silently swept through Bhopal. Anyone who was already weak or frail was affected most seriously. Exposure to the gas caused vomiting and difficulty breathing. When the gas hit the train station, stampedes resulted as people tried to outrun it. Victims flooded the area hospitals, which were not prepared for the onslaught. The best and most effective treatment was a simple wet cloth over the face, but virtually none of the medical personnel dispensed this information. An exact casualty count was impossible to determine in the aftermath of this disaster but most estimates place the death toll at over 2,000. An estimated 200,000 people were affected in some way by exposure to the gas. Some were blinded; others experienced serious sleep or digestion problems following the disaster. About 10-20 percent of those exposed were still suffering serious problems, such as memory loss and nerve damage, a year later. 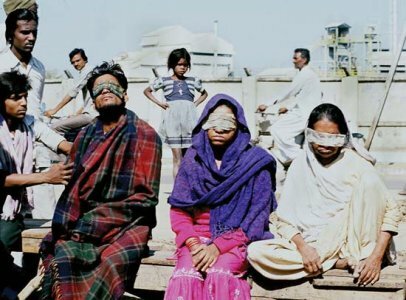 When Union Carbide officials arrived in India following the Bhopal disaster, they were arrested. None were convicted, despite evidence suggesting that management was substantially negligent in the management of the plant. The Indian government sued Union Carbide in a civil case and settled in 1989 for $470 million. Because of the great number of individuals affected by the disaster, most Bhopal victims received just $550, which could not pay for the chronic lung ailments, eye problems, psychiatric disorders, and other common illnesses they developed. The average compensation for deaths resulting from the disaster was $1,300. The Indian government, famous for its corruption, has yet to distribute roughly half of Union Carbide’s original settlement. Union Carbide, which shut down its Bhopal plant after the disaster, has failed to clean up the site completely, and the rusty, deserted complex continues to leak various poisonous substances into the water and soil of Bhopal. Site contents copyright © 2019 Recorder Online	except as noted. All rights reserved. | 81 queries in 1.981 seconds.